Keeping Wisconsin’s machinery in working condition since 1980! For more than 35 years, Cliff Industrial Corporation has been using state-of-the-art equipment and proven methods, applying specialized skills and expertise to keep your machinery up and running. 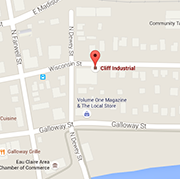 When you do business with Cliff Industrial Corporation for your machinery and repairs, you know you are receiving the highest quality service available in the Eau Claire, WI area. If your machinery calls for gears, belts, pulleys, bearings, sprockets, roller chains, or any metal fabrication product, you won’t find a more trusted machine shop than Cliff Industrial Corporation!